...When I was in college for my undergraduate work I was immensely interested in politics and things related to them. At the same time I had little interest in becoming involved in the student government organizations that were available because more times than not the students who were involved in them shouldn’t have been there in the first place. Most of them were involved for the power of the position or because they seemed to think that belonging to such a group might make them appear more intelligent than they really were. ...It’s too bad that the more things change, the more that they stay the same. 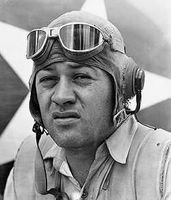 ...At the University of Washington, a student proposed erecting a small memorial of former student and World War II legendary pilot Gregory “Pappy” Boyington, who shot down 28 Japanese planes and led the famous Black Sheep Squadron. In response, the school’s student senate shot the idea down. ...Other students opposed the memorial because it would “honor war,” but there was no word on whether these students were going to cut down the trees on UW’s main entrance which honor 58 former UW students who died in World War I. ...In the end, though, my favorite student comment was one that was on a televised interview regarding this story. The young man said that Boyington shouldn’t be honored because it’s not as if he had been a physicist or famous actor. It’s good to know that today’s college students equate physicists with actors. ...The future looks really bright knowing that these kids are tomorrow’s leaders.